In the Old West, the sleepy town of Rose Creek is plagued by savage outlaws, led by Bartholomew Bogue (Peter Sarsgaard). They burn down a church and slaughter many of the innocent civilians. The widow (Haley Bennett) of one of the men they killed approaches Sam Chisolm (Denzel Washington) to ask for help. He agrees and rounds up a group of six diverse men, including Josh Farraday (Chris Pratt), to take on the outlaws. 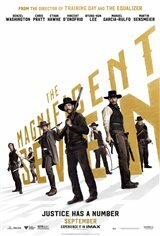 Based on the 1960 movie The Magnificent Seven starring Yul Brynner, Steve McQueen and Charles Bronson, which was based on the Japanese film Shichinin no samurai (Seven Samurai) by Akira Kurosawa.